In this article we will examine an instrument that is so important that the life of its operator depends on it. The operator in question is a diver, submerging in a hostile environment either to make a living, or to hunt fish. No, it is not a big dive computer with a huge lcd screen that performs countless calculations per milisecond based on complex algorithms. This is Monochrome, so we are going to investigate a very unique instrument which is strictly mechanical: a watch. 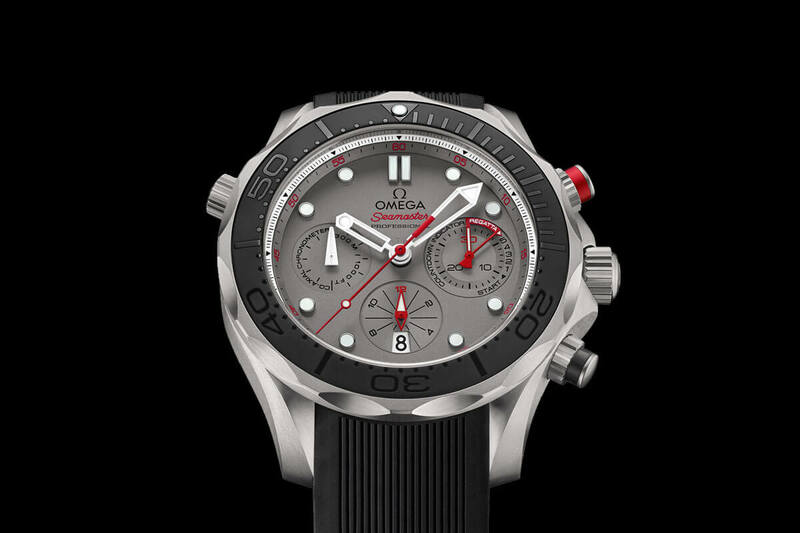 A diver’s chronograph watch to be more precise – the Omega Seamaster Automatic 120m Chronograph a.k.a. Big Blue. The history of the diving watch is intimately coupled, right from the start, with the human attempts to master and understand life underwater. Either in war or for recreational diving, whether in spearfishing or servicing oil rigs in the North Sea, the diving watch has been a timekeeping apparatus of utmost importance to the life of the diver in question. The first ever specialised diving watches were the Panerai, used by the Italian frogmen in the Second World War. Actually they were Rolex 3646’s with a special dials made by Panerai, worn by the elite Decima Flottiglia MAS. Right after the war in France, Captain Robert ‘Bob’ Maloubier and Liutenant Claude Riffaud, both of the French combat diving corps, started to search for a watch capable of withstanding their military diving missions – and they were thus instrumental in helping Blancpain introduce the legendary Fifty Fathoms in 1953. In addition the first commercially successful scuba set, the Aqualung twin hose open-circuit unit was debuted during that same era. Developed by Emile Gagnan and Jacques-Yves Cousteau, it was a system in which compressed air carried in back mounted cylinders was inhaled through a demand regulator and then exhaled into the water adjacent to the tank; the introduction of a capable/specialised diver watch and of the SCUBA (Self Contained Underwater Breathing Apparatus) were two monumental steps for opening up the exploration of the depths. 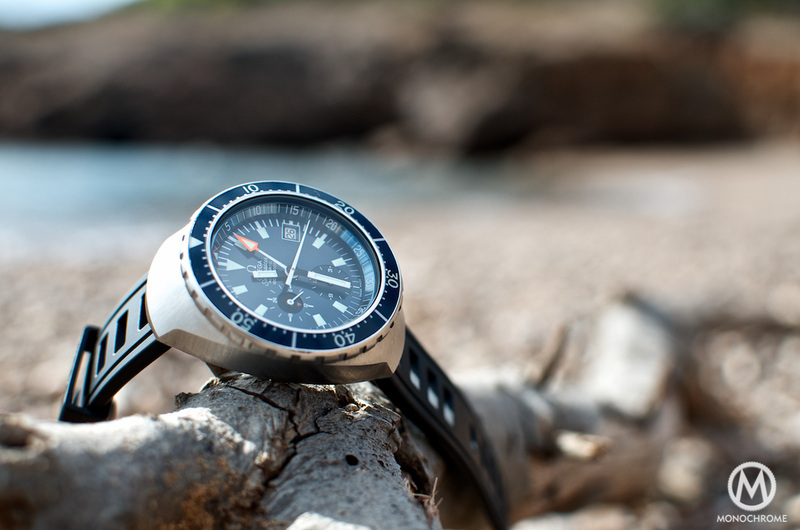 From that point onwards most of the Swiss companies started to shift their attention towards the sea, trying to produce reliable underwater-capable wristwatches. Rolex, which produced the first oyster case watch in 1926, and Omega, with its Marine model in 1932, began to understand the peculiarities of a watch specifically designed for use in exclusively underwater environments. A proper diver watch should have been big, easy to read underwater, hermetically sealed and capable of withstanding shocks. The transformation of the simple water resistant watch to the tool diver watch happened at that exact point. Rolex stepped out with perhaps the most famous diver watch of them all, the Rolex Submariner; and Omega introduced the iconic Seamaster 300. 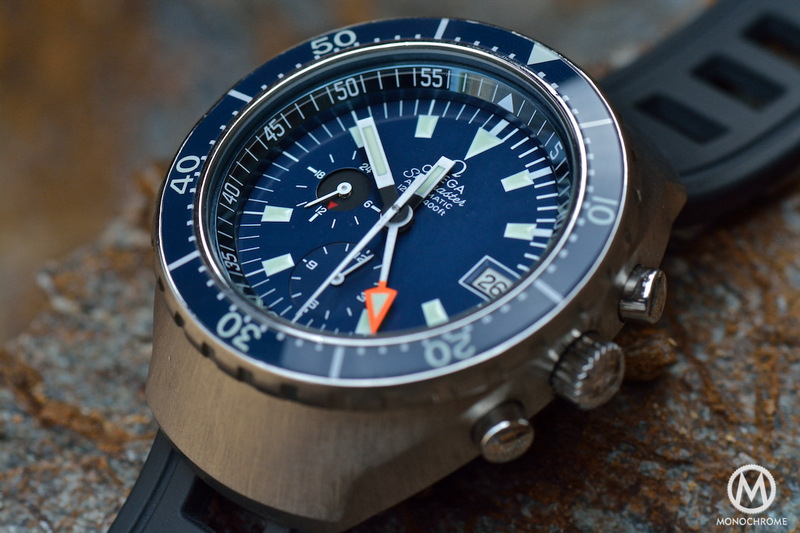 Countless other companies followed, most notably Seiko, Doxa, Breitling and IWC. However, from the late 1960’s to the 1970’s the industry started to work closely with Swiss companies. More specialised watches were needed, watches capable of withstanding deeper and deeper submersion. Helium valves, use of exotic metals, and many other technical novelties happened at this period, exponentially increasing water resistance in watches. The Doxa Sub, the Rolex Sea Dweller, the Omega Ploprof and many other watches started to become available, either to companies like Comex or in the general public. This decade constituted the golden age in the history of the diving watch. Up to this point we have touched on the three hand watch which in conjunction with the bezel could be used to measure elapsed time up to an hour. Another approach, and perhaps a much simpler one, was to use a diver watch with a chronograph movement modified with a central minute hand. The minutes counted would be the minutes displayed from zero, so the diver could more easily understand how much time had elapsed. The first such offerings were the Aquastar Benthos, released in the mid 1960’s, and the Breitling SuperOcean ref.2005 (which we will review in a future article). 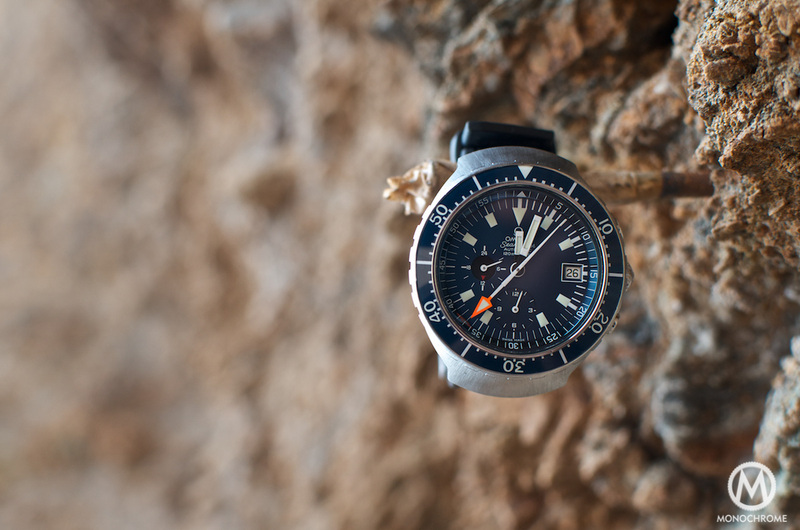 The Benthos and the Breitling constituted a bold step in the history of the diver watch. An evolutionary step which some companies did not follow (Rolex), while others espoused it boldly (Omega), introducing the groundbreaking Omega Seamaster Automatic 120m Chronograph (Ref.176.004), or as the collectors call it: the Big Blue. 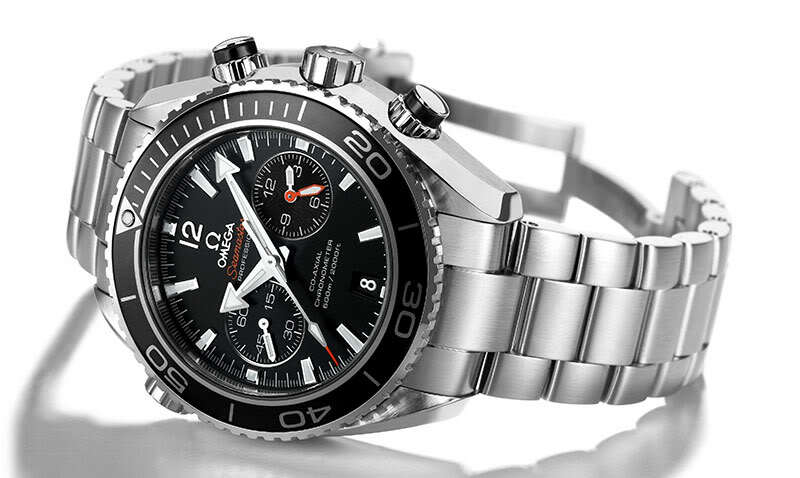 Omega perhaps understood better than any other company the essence of the diver watch. 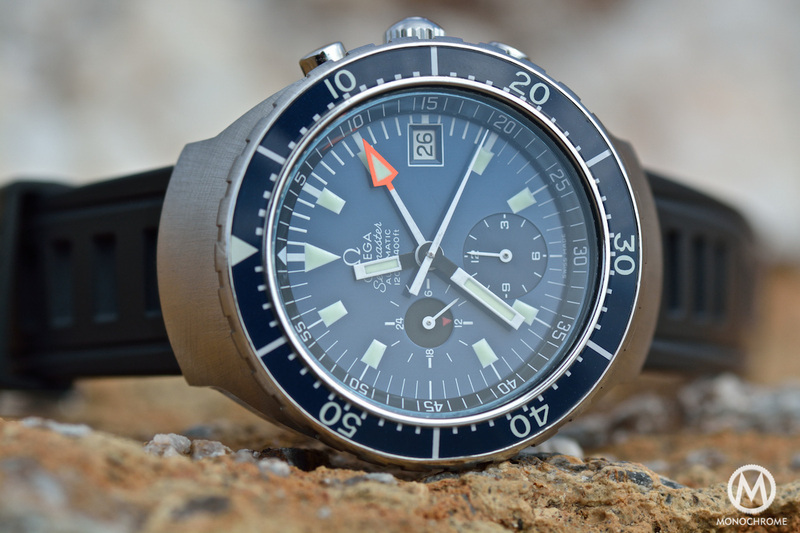 From the first Seamaster 300 (Ref.CK2913) up to the British Military-issued Seamasters (Ref.165.0024), and from the purpose-built Ploprof (Ref.166.0077) up to the Seamaster 1000 (Ref.166.0093) or ‘The Grand’ as collectors refer to it, the company tried to improve the whole idea of the diver tool watch by experimenting with new materials or bold technical approaches in order to solve issues the watches faced in extreme environments. 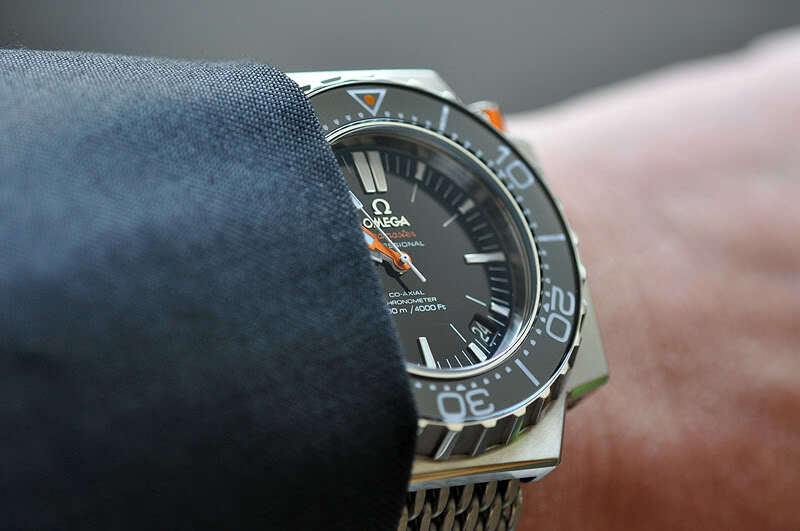 This feedback was mirrored in the offerings for the general public – or sometimes Omega just sold us all the exact same watch that, for example, Cousteau’s divers wore on their missions. The Big Blue represents all the lessons that the company had learned up to that point. The engineers at Omega had the idea to overcome the combination of the three hand/bezel offerings and produce a chronograph with a big central minute hand. For that they needed first and foremost a caliber that could support this configuration and could be robust enough and highly accurate. The obvious choice was the caliber 1040. In the early 1970’s, Lemania introduced its own version of the automatic chronograph caliber, the cal.1340, running at 28,800bph with 22 jewels having a 44-hour power reserve. Omega also introduced the same caliber as the cal.1040, having a 24-hours indicator placed at 9 in the second sub dial. It was a rhodium-finish caliber, having a cam/lever combination and other architectural choices inherited from its ancestors (Omega 27 CHRO 12). It had a delrin blocking lever and a date with a quickset function as well, while the rotor was mounted on ball bearings so it could wind the movement in both directions. The caliber was first introduced in Omega’s lineup with the Omega Seamaster chronograph (ref.176.007) and the Speedmaster MkIII (ref.176.002) in 1972. Did you know that in 1973 Omega launched the first COSC certified chronograph calibre? Well they did with calibre 1041, which is a variation on calibre 1040. It was first used in the legendary Speedmaster 125 (ref 378.0801) that was made for the 125th anniversary of Omega. Highly collectible these days, as it was limited to 2000 pieces, making of it the first officially certified chronograph chronometer in the world. So the Big Blue had an extraordinary movement that had all the ingredients needed to power a proper tool diver chronograph. Another characteristic that made the watch stand out from the crowd was its size and, most notably, its shape. Weighing a whopping 176 grams, it measured 47mm in width, including the crown; 52mm in length; and 17mm thick, with a 22mm lug size. The Big Blue was so huge since the engineers had in mind to build a watch which was highly legible in the hostile underwater environment. The helmet-shaped case is distinctive. The company first introduced helmet cases in 1969 in their Flightmaster model (see here and here for two in-depths about the Flightmaster) and continued the trend with the Speedmaster MkIII. 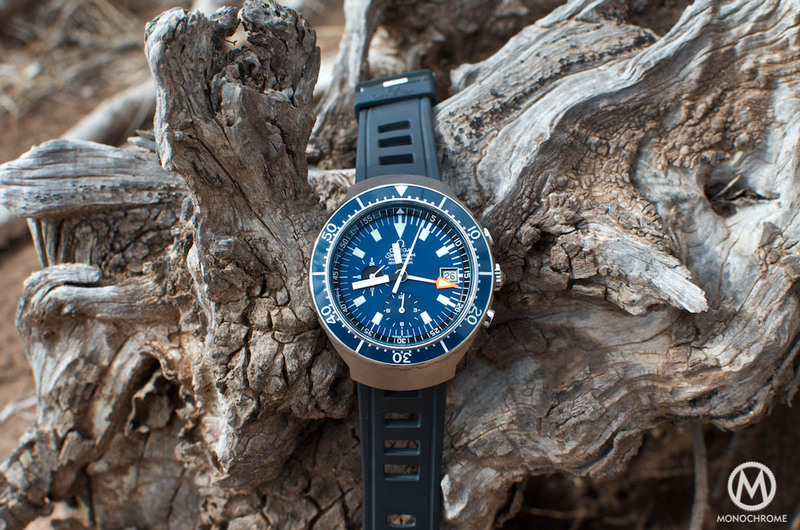 The Big Blue had its case milled from a solid block of stainless steel contoured in such a way to be extremely comfortable while at the same time offering protection for the watch from shocks and bumps during the dive. If we look closely the case has a characteristic protruding bumper that was just perfect for this objective. Many collectors refer to the weight and the height of the watch, which do create some problems. First, Omega sold the watch either with the flightmaster style bracelet, the mesh bracelet, or with an isofrane waterproof strap. These make the watch extremely comfortable, however any attempt to change to a thinner strap might lead to an unbalanced feeling on the wrist. Second, the height of the watch means that it’s very easy to pick up damage on either its case or its bezel. 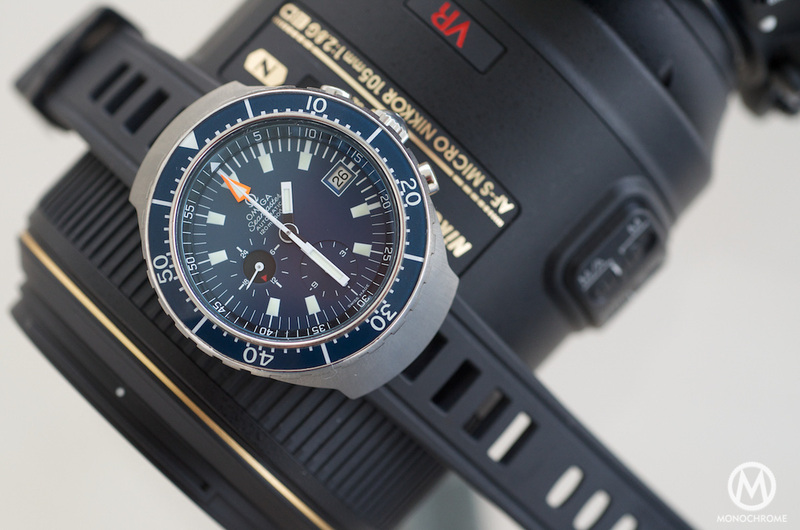 Since these watches were extremely expensive (CHF 715 in its year of introduction) and marketed as tool watches, they were mainly bought by people who actually used them on the job (i.e., on dives); this exposure took a toll on the watches. If we put in the equation the small production run of the model, it is very difficult to find a perfectly preserved Big Blue in original condition on the market at the moment. If you do, the price is high. The dial of the watch and the bezel are also highly characteristic for this model. The blue color, as you see in the pics, is extremely eye catching and changes tint depending on the angle you look at it from. The configuration is classic 1040 caliber. Central minute (big orange arrow-shaped hand) and seconds hand (two versions), a date window at three o’ clock, a 12-hours sub dial at 6 o’ clock, and a 24-hours indicator placed at 9 in the constant second sub dial. The minute and hour hands are fat and the hour indicators are big chunky blocks full of tritium paste. Here we can refer to another problem, since after many years of use and due to the specific characteristics of the tritium as a material, the blocks started to deform and literally spill onto the dial. Aside from its peculiarities, though, all of the Big Blue’s features create – in my humble opinion – a truly stunning watch. 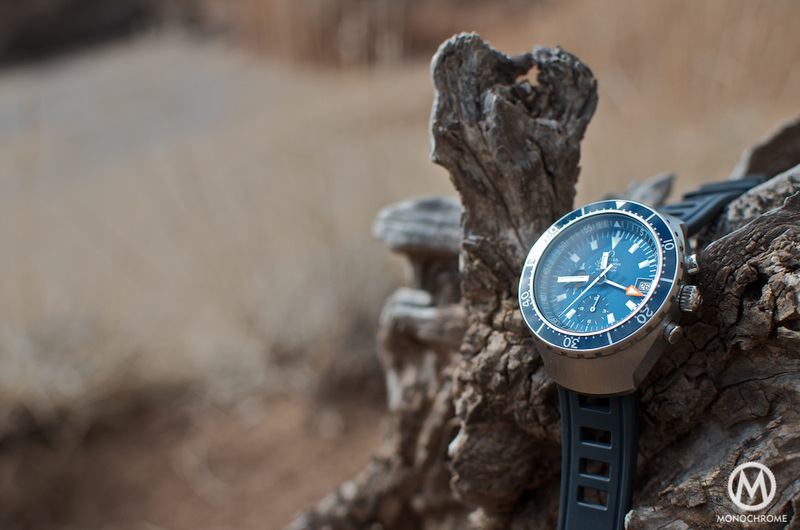 The unique configuration of the case, the blue color of the dial, the sheer size and weight of the watch, the high quality build that characterizes everything produced by the Omega watch company – all constitute a watch that is a milestone in the history of diving watches. 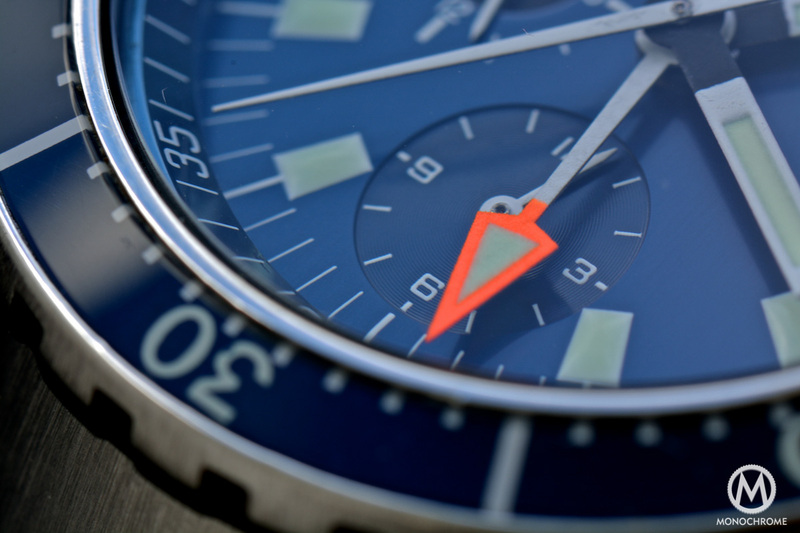 The Big Blue has an amazing presence and it is beautifully detailed in its entirety with stunning details such as the unique orange arrow-shaped central minute hand or the sunburst finish in its case. 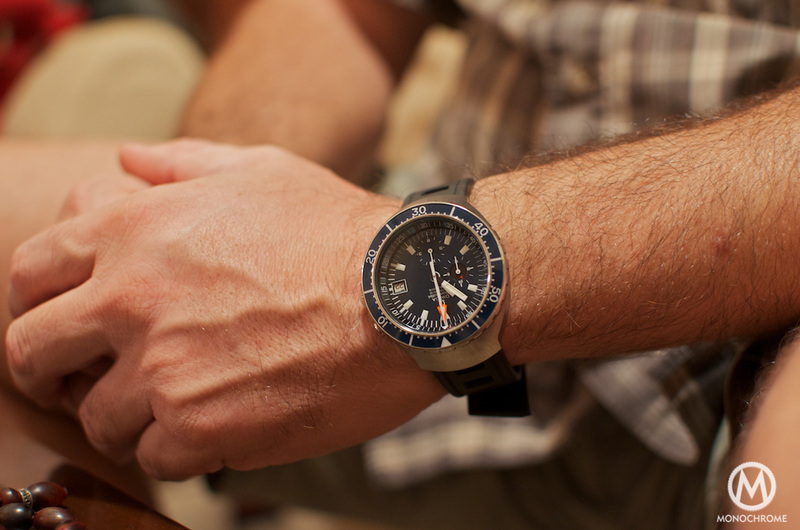 Although it is a watch that was produced almost forty years ago it looks modern – something I can validate myself since every day that I wore it (for the purpose of this review), I had people asking me about the watch. 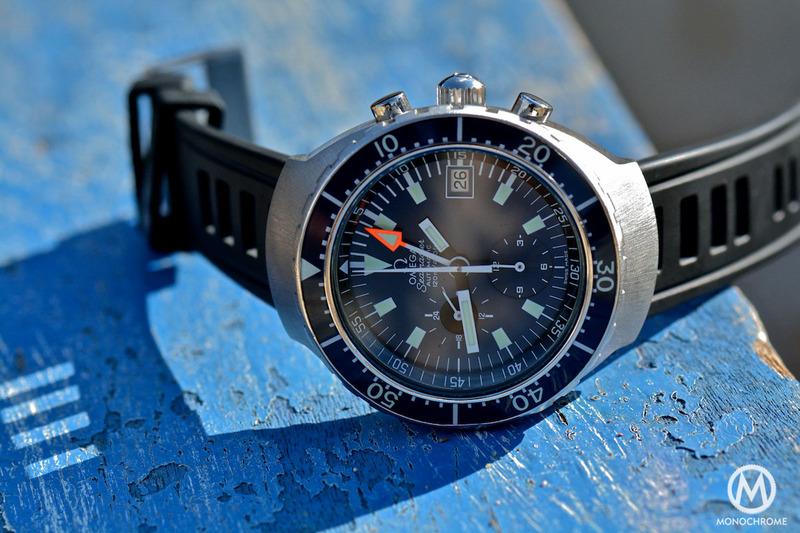 The Big Blue is certainly a unique piece, the first automatic diver chronograph produced, (rated at 120 meters) that comes from an era when watches were produced by engineers having to solve specific issues or trying to create an instrument that would help the right people at the right job. Marketing had nothing to do with the creation of the Big Blue. 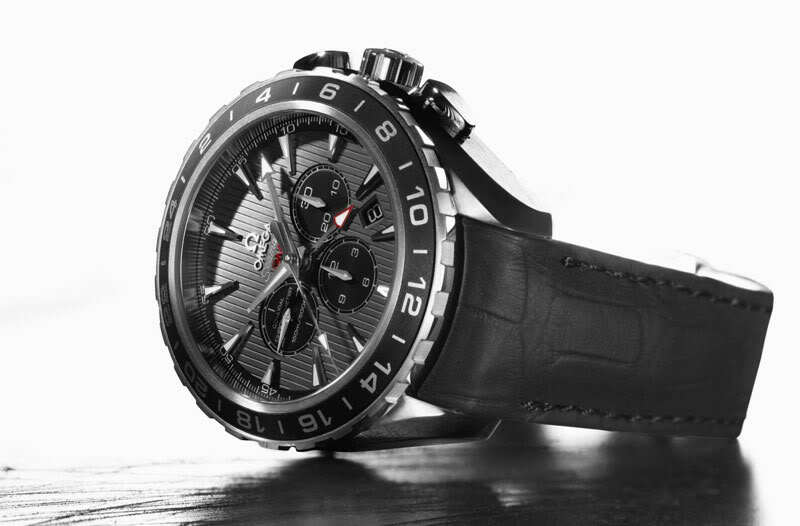 It was a purely professional product that continued the bloodline of great professional tool watches by Omega. The Speedmasters, Railmasters, Seamasters were all created with the sole purpose of functioning flawlessly in accordance with the specific parameters set by the people who used and relied on the watches as tools. Nowadays this trend no longer exists and the tool watches of the past have been transformed into jewelry and status symbol items. This is absolutely understandable, since technology permits us to have more accurate tools (dive computers for example) that do the job and do not cost a fortune, this also highlights the different mindset of the companies, and most of all of the buyers, nowadays. 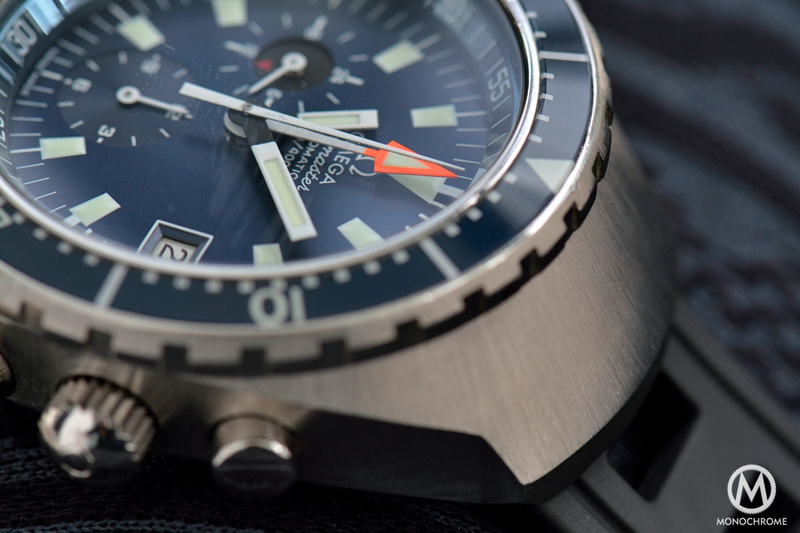 The Omega Big Blue was a bold statement representing an era that has since irreversibly passed. It was a chronograph that, although produced in small numbers and for a short period of time, proved how important it is for a company to experiment with its offerings. A watch is more than the sum of its parts; the Big Blue’s huge case that provides functionality, comfort and protection, the outstanding 1040 caliber, the highly legible dial are only elements of the big picture. The Seamaster Big Blue was the first truly tool diver chronograph on the market and, at the time of its launch, was ahead of its time. 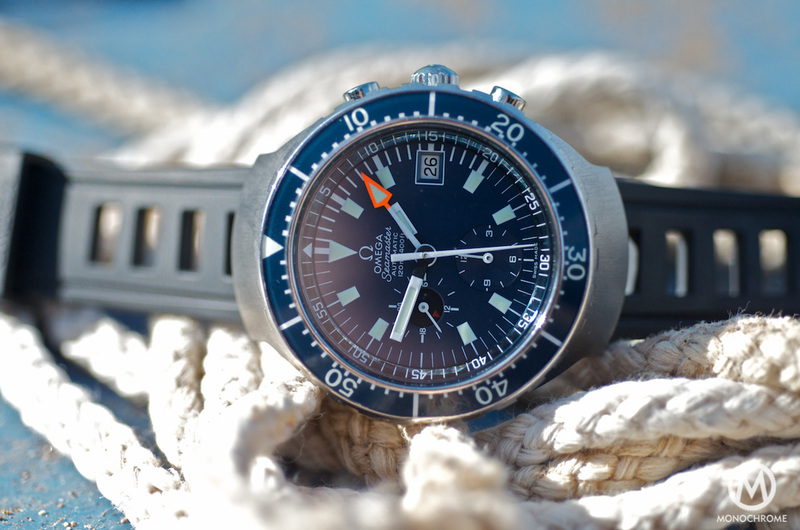 Although it does not enjoy the legendary status of the Ploprof or the universal appeal of the Seamaster 300, it stands as something very unique in the company’s diver bloodline. 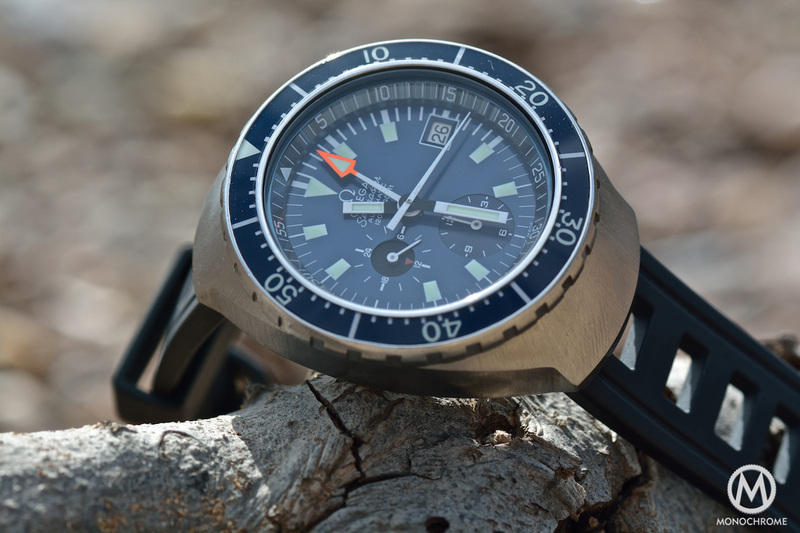 As such it deserves more recognition from the collectors circle and most importantly it must be understood that it is one of the coolest diving watches ever made by any watch company. The Article could not have been possible without the valuable help of Kostas P and Litsa D. The First for kindly loaning me the watch which he meticulously restored in his shop (Chrono Technica Athens). The Second for her valuable help and ideas in the photoshoot of the Big Blue. Cheers! Exquisite in-depth review of a truly iconic chronograph and I am sure that this is by far the most complete article in the net covering an example. Your watches look absolutely amazing! I’m in love with that watches! 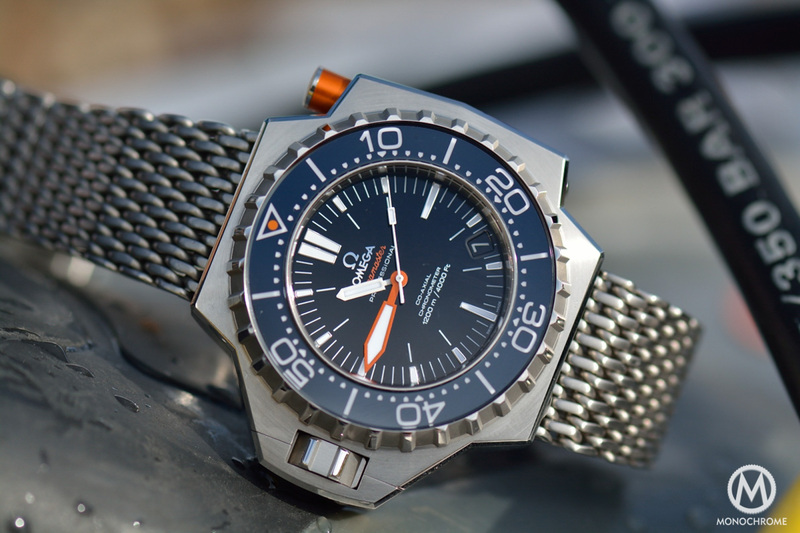 The most amazing thing with this article is that not only provides the reader with plenty of information but also manages to pass him the feeling of that era concerning the purpose-built timepieces in general as well as, lets say, the “brave” design philosophy of Omega in particular. The stunning photographs are just the icing on the cake. Lucky boy!!! Pleased that you enjoyed the article! Enjoy your new watch! I have a Flightmaster Omega and would trade it for this model.